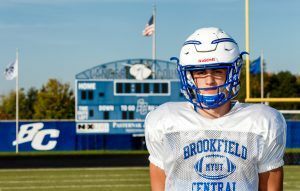 After watching Brookfield Central junior running back Zach Heckman bust a 60-yard run for a touchdown, it is hard to imagine he started his career as a lineman because he was ‘too big’ to play in the backfield. Heckman is now 5-feet, 11 inches and 175 pounds, by no means intimidating based on his size. But once he gets the ball in his hands, he’s the total package according to Lancers coach Jed Kennedy. Heckman averages over 6.0 yards a carry and is one of the top rushers and scorers in the area and the state. Heckman, however, was down to earth when asked about his goals. “Malik Turner was a great running back and there hasn’t been that drop off with Zach,” Kennedy said of last year’s starter. “Zach’s been really, really good. Like all good running backs, Heckman knows that he wouldn’t be successful without the work done by his offensive line. Central plays an unbalanced line. Starting on the left side is senior quick guard Cody Moua (5-10, 215), junior center Alex Wille (5-11, 226), junior strong guard C.J. Heaney, senior inside tackle Jacob Vetta (6-2, 254), senior outsidetackle Sam Ockwood (6-2, 250) and senior tight end Jacob Ozolins (6-6, 235). Kennedy saw Heckman play the summer before he was hired. When asked about Heckman’s strengths, Kennedy was quick to reply. “With him it’s a combination of everything,” he said. “He can catch the ball out of the backfield. He’s fast enough to make the great run. He’s powerful enough to get the tough yardage. If you look at Whitefish Bay (a 50-43 win in the opener) he had 40 carries, averaged over 4 yards a carry. He’s between the tackle tough, getting 4-5 yards a run. Heckman through 8 games has 1,257 yards in 192 carries with 17 touchdowns, averaging 6.5 yards per carry. He has twice carried the ball 40 times and twice he went over 200 yards rushing – against West Allis Hale he had 206 yards and against Marquette he rushed for a season-high 238 yards. His lowest total was 101 yards in a rout of Brookfield East. He scored 4 touchdowns against West Allis Central, 3 touchdowns against Whitefish Bay and Hartford, 2 against West Allis Hale, Brookfield East and Marquette and once against Wauwatosa East. It shouldn’t surprise anyone that Heckman was involved with the Lancers biggest win of the season, when he sparked his team to a 35-30 fourth quarter comeback over Marquette in a battle for the Greater Metro Conference title. The Hilltoppers just took a 24-14 lead at the end of the third quarter, when Heckman quickly put the Lancers back on top. First he ripped off a 60-yard touchdown run around end, leaving the Hilltoppers in his dust. Then after Marquette fumbled the kickoff, he ended the drive with a 3-yard score, giving Central the lead for good, 28-24. Heckman talked about his strong points, which includes his yards after being hit. But he realizes he still can improve his game. Kennedy paused a second when asked what Zach needs to work on. “Continuing to improve inside of our scheme,” he said. “He’s one of the top (runners) in the state in rushing. It’s hard to tell him to improve. He’s really, really good. Catching the ball would be fine with Zach. One of the reasons Zach and his teammates have been so successful has been their balance on offense. Kennedy agrees with Zach when looking at the big picture. Kennedy feels that when it comes to leadership, Zach leads the Lancers by example. Zachman agrees with his coach’s assessment. Despite all his individual accolades, Zach knows what the big picture is all about. Kennedy knows what he has in Zach (What the) Heckman. FAVORITE MOVIE: We are Marshall. Documentaries, Action Movies. FAVORITE TV SHOW: The Office. Comedies. WHAT DO YOU DO TO RELAX? Play video games (Madden Football). FAVORITE SPORTS RIVALRY/ATHLETE: Brookfield East. MOST MEMORABLE SPORTS MOMENT: Eighth-grade Jr. Lancers making the AAYFL Championship Game. WHAT WOULD YOU LIKE TO DO IN THE FUTURE? Major in Business. Play college football.